Situated between Bella Coola and Tatla Lake, the wide open lands and mountain backdrops are just waiting to be explored! It really all depends on how you like to travel. Fly-in or horseback riding tours to reach the excluded areas of the Ilgachuz Mountains are a definite outdoor enthusiasts treat. From this vantage point travelers can experience the wilderness first hand and learn about the land, the history and people who have made this area home for centuries. Or canoe the famous Blackwater River solo or as a team and make your way to a central pick or food cache drop site, like a real expedition of your own design! If visitors prefer to catch lunch themselves, a fishing trip to some of the local fishing holes would be a good bet. Even in the heart of winter, fishing can become a whole new experience when guests attempting ice fishing! Hunlen Falls, Tweedsmuir Provincial Park 895,000 hectares. Dean River, #1 steelhead fishing river in the world, and Grizzly look out. Anahim Lake area was the home to a scattered group of Chilcotin First Nations, the Carrier Natives who were drawn from their remote villages to the first white settlement, one of the longest standing Chilcotin settlements, Anahim Lake, in the 1940's and 50's. 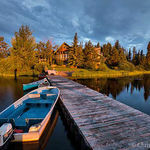 Das Eagle's Nest Resort liegt am wunderschönen Anahim Lake und ganz in der Nähe des spektakulären Tweedsmuir Parks.